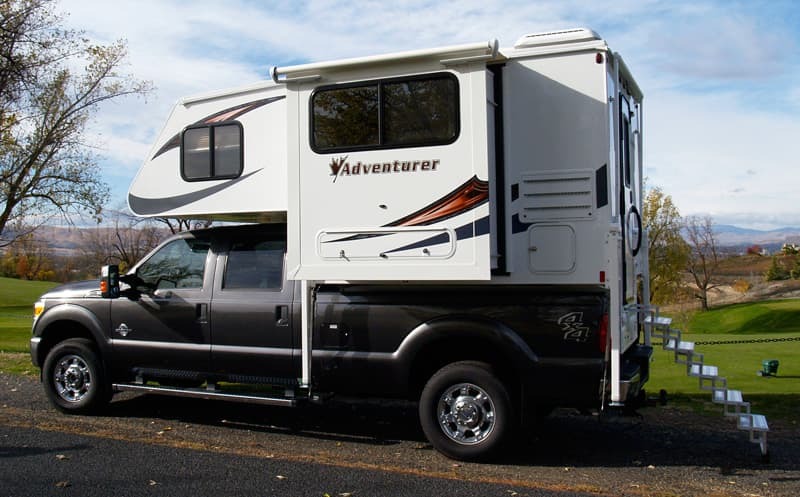 Adventurer Manufacturing introduces the 2018 Adventurer 80S, an 8-foot hard-side, single-slide, wet bath truck camper. The light-weighting discoveries from the development of the 80S could be a game changer. In the automotive industry, the concept of light-weighting is the process of removing weight from an automobile to improve the fuel efficiency and overall handling of that vehicle. Examples of light-weighting include the use of high-strength steel, composites, military-grade aluminum, aluminum foam, and even carbon fiber. Light-weighting is not restricted to material science, but rather any design change that reduces the weight of a vehicle while maintaining or improving its structural integrity. For example, sometimes a structural element can be redesigned with less material while actually increasing the strength of the automobile. Even better, this type of light-weighting is often possible with no additional material or production costs. The all-new 2018 Adventurer 80S is the latest example of what can happen when the truck camper industry pursues the concepts of light-weighting. With a dry base weight of just over 2,000 pounds, the Adventurer 80S represents a light-weight breakthrough for slide-out truck campers. Perhaps even more compelling than the new Adventurer 80S itself are the light-weighting design concepts and material applications that were discovered during its development. From our conversation Adventurer, we can expect to see a number of these light-weighting innovations make their way into future Adventurer and Eagle Cap truck campers. For the full story behind the 2018 Adventurer 80S, we talked to Greg Tucknies, Director of Sales and Marketing for Adventurer Manufacturing. The 2018 Adventurer 80S is a hard side, single-slide, wet bath truck camper made for short or long bed trucks. The interior floor length of the 2018 Adventurer 80S is 8’0”, the interior height is 78”, and the center of gravity is 34”. The 2018 Adventurer 80S has a 20 gallon fresh tank, a 14 gallon grey tank, a 14 gallon black tank, and a 4 gallon hot water heater. It can accommodate one battery and has one twenty-pound propane tank. Adventurer is reporting the base weight of the 2018 Adventurer 80S to be 2,010 pounds. The base MSRP for the 2018 Adventurer 80S is $22,680. Above: 2018 Adventurer 80S on a 2016 F350 long bed truck. All photos provided by Adventurer LP. 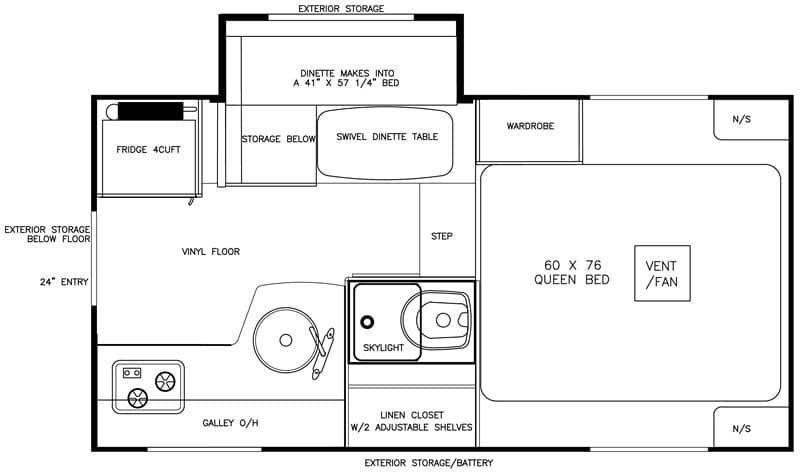 TCM: Adventurer is known to debut a new floor plan specifically to beat the pants off another Adventurer model that’s getting long in the tooth. In this case, we suspect the eight year old 80GS better pull up its shorts. Greg: Actually, the Adventurer 80GS is still going strong. We originally thought the 80RB was going to eliminate the 80GS. The 80RB is now our number one seller, but the 80GS is also solid. At this point, there are no plans to discontinue to 80GS, but we will let the marketplace determine our decision. TCM: On paper, the idea of a slide-out truck camper for half-tons is a non-starter. Half-ton trucks don’t generally offer enough payload to even consider the thought, and slide-outs add a considerable amount of weight to a truck camper design. So how is it that we’re here talking about a slide-out truck camper for a half-ton truck? Greg: 90-percent of what we do is customer driven. We have heard time and time again from customers that the 80GS would be better if it had a dinette slide. That put the 80GS project on our engineering books about four years ago. When the average retail customer asks for a floor plan or feature, they don’t necessarily understand what it takes to make that happen. Early on we determined that there was no way to have a slide-out go up and over the box rails without a basement. To add a basement the camper would need additional framing and walls. The weight of the basement, additional walls, and the slide-out put the weight beyond the half-ton target, so we pushed the project off. Over time, the 80S became a challenge for our Dave Frampton, our General Manager, and Shawn Mathews, our Head of Engineering. Together they developed a whole new approach. TCM: To be absolutely clear, you’re not recommending the 80S for every half-ton truck, nor are you limiting its compatibility to half-ton trucks. Is that correct? Greg: That is correct. We state on our website that the 80S is only for select half-ton models. In general, the 80S is a better payload match for three-quarter tons. And the 80S is particularly well suited to three-quarter ton and one-ton truck owners who want to tow boats, trailers, and other towable toys.